One of the best ways to enjoy a baseball game is by keeping score like the pros do. You can do this by using the baseball score sheet PDF file. This sheet is the perfect companion for any fan attending a game. It’s also ideal to monitor stats at a Little League, High School or recreational game. Get the baseball score sheet PDF file here free today! To download the baseball score sheet PDF file, simply click on the link located on this page. After clicking it, you will have the option to save it to your computer or print it off. If you fail to save it to your computer, you can return to this page and any time and download it again. You can also print off as many copies of the baseball score sheet PDF file as you need. You can print as many for a single game or the entire season. 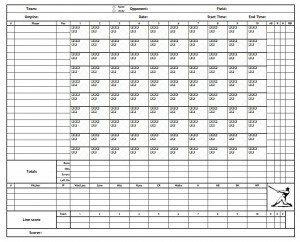 The baseball score sheet PDF file is a traditional score sheet that comes in the form of a PDF file. At the top of the sheet is room for both the home and away team, the field or stadium where the game is being played, the umpire or umpires for the game, the date the game is being played, when the game starts and when it ends. Next, add the lineup to the baseball score sheet PDF file. There is ample room for the starting lineup, as well as space for pinch-hitters or defensive replacements that may enter later in the game. Beneath the lineup, you will notice an area to track the runs, hits, errors and men left on base in each inning. The next area on the baseball score sheet PDF file is reserved for all of the pitching stats. Here you can track things such as hits, runs, walks and strikeouts. You can also mark the winning pitcher, losing pitcher and it a pitcher records a save. Never miss a play again with the baseball score sheet PDF file. Download and print the baseball score sheet for free today!